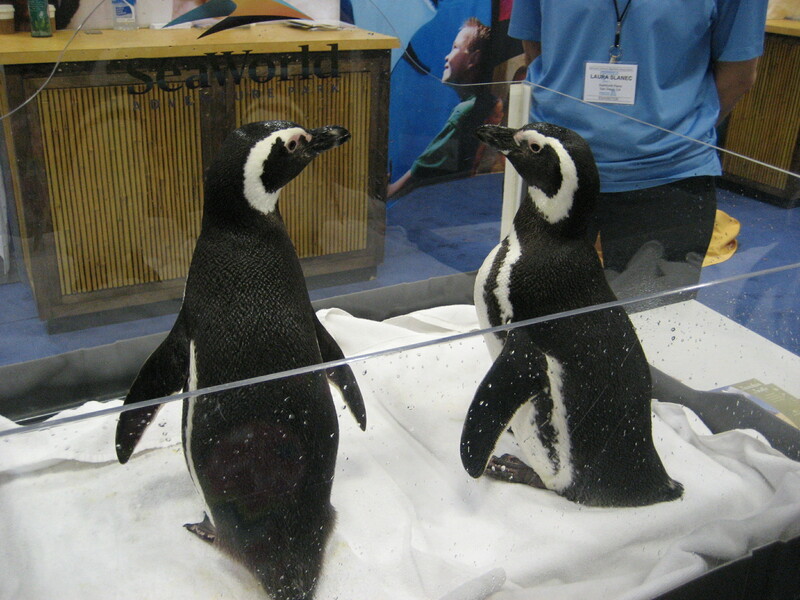 In addition to the nearly 15,000 teachers who made it to San Francisco for the NSTA Convention, two avian members of the Sea World education team found their way into the exhibit hall. They were the stars of one of hundreds of exhibits in the exposition hall. I was particularly fascinated seeing the penguins’ tiny feathers up from only a few inches away. They are incredibly small, shiny, and densely packed… as many 100 per square inch! Today being my only day to explore the conference without having to present a workshop, I took the opportunity to explore the exhibit hall looking for new resources and ideas to bring back to my classroom. From an interactive anatomy model to a 360 degree Earth Projector to a construction kit that allows students to build three different types of renewable energy vehicles, the room was filled with creative new ways to engage students. I’m off to finish my preparation for tomorrow’s workshop, but will be sharing photos of and links to the many amazing resources I discovered in the coming days.